Wind Vest for Triumph, Indian, Victory and Production Customs and Choppers. WindVest for Triumph, Indian, Victory and Production Choppers. When you are looking for latest in motorcycle windshield technology for your unique motorcycle. WindVest is different from the other windscreens you will find for these less popular manufactures. It has a unique design with a wind combination that deflects the wind blast from your face and chest area and makes your ride more comfortable and less tiring. WindVest is the perfect choice for your custom production chopper as well. Show quality finish and hardware allows you to add style and comfort without compromize. 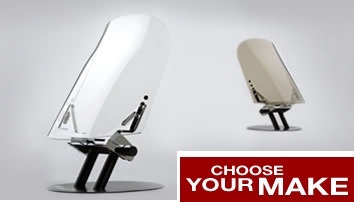 Select Your Make of Motorcycle to see available windshields. WindVest the best performance windscreens in the world. WindVest makes a large selection of windshields to fit most custom manufacturers. Please contact us and we will gladly help you find the WindVest to fit your custom application.